And on the second day of 2016 NHK Trophy, a new short dance world record was set. All the buzz in the early afternoon in Sapporo today was around Tessa Virtue/Scott Moir breaking an almost three-year old short dance world record set by 2014 Olympic champions Meryl Davis/Charlie White in Sochi. On the surface, it's business as usual. Virtue/Moir fans thought it was totally deserved, and Davis/White fans were like, "but the twizzles!!" And it is compounded by the fact that Virtue/Moir didn't max out their levels and trailed Davis/White by 0.20 in the base value department. It's true, Virtue/Moir were not at their absolute best, with Moir having a slight hiccup at the end of their twizzle sequence that cost some GOEs. But it's also true that the world record was deserved, because everything else was spot on AND because GOE valuation has changed since Sochi that makes comparing the two short dances not apples-to-apples. The biggest culprit for the difference in the numbers here is the maximum TES. Since Sochi, the maximum GOE, that is to say the actual execution points given to an element that is judged a +3 GOE, has increased for many elements in ice dance. 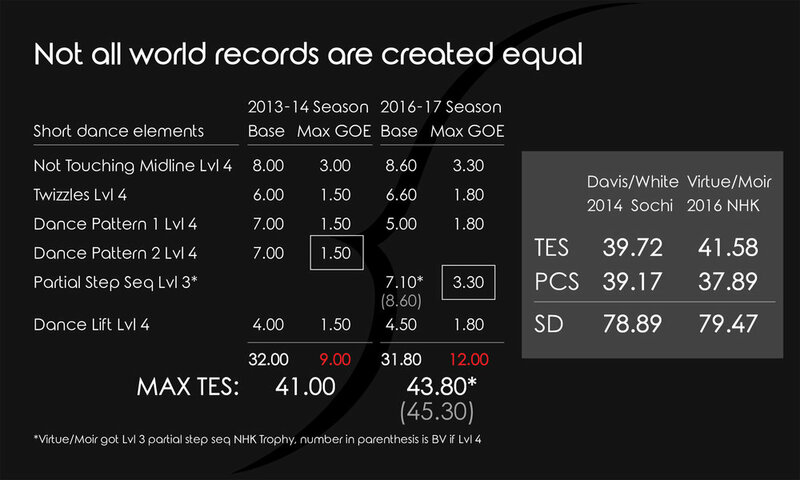 Even though Davis/White and Virtue/Moir had almost the same base value, the max GOE for Virtue/Moir at NHK is a full THREE points higher than the max GOE for Davis/White. The maximum GOE for four of the five elements has increased by 0.30 each since Sochi. The partial step sequence replaced the second dance pattern, and the max GOE for the partial step sequence is a whopping 1.80 higher than the max GOE for the second dance pattern. Again, you can't compare apples-to-apples, because the the elements have changed. But if you apply the new max GOEs to Davis/White's marks from Sochi, keeping PCS the same, their short dance would actually score an 80.13 as opposed to the 78.89 that they got in Sochi. Whatever the numbers say, there's no doubt that Virtue/Moir just set a new standard for the short dance this season. There's also the fact that Virtue/Moir haven't maxed out their base value yet, had they done so, their short dance score would have been a point and a half higher. Should you wish to read on, because you love numbers, here's another nuance to address, and that's the difference in base values since Sochi that we are seeing here. The result is that the maximum base value for the short dance in 2016-17 is 33.30, 1.30 points more than the 32.00 maximum base value for the short dance in 2013-14.